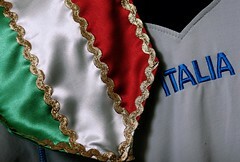 Italy strengthened their grip on UEFA EURO 2012 qualifying Group C after an impressive victory against Estonia in Modena. Goals by Giuseppe Rossi, Antonio Cassano and Giampaolo Pazzini earned the Azzurri their fifth win of the campaign, which has all but secured their place in Poland and Ukraine nest summer. They have the chance to move closer to next year’s finals in their next fixture, on 2 September against the Faroe Islands, who are Estonia’s opponents on Tuesday. Italy dominated this match, as its midfield of Andrea Pirlo, Alberto Aquilani and Riccardo Montolivo completely dominated the game. Up front the partnership of Cassano and Rossi looked dangerous all game. It was the two strikers who combined beautifully after 13 minutes when Cassano was put clean through by his fellow forward only to be denied by the legs of Sergei Pereiko, who then had to repel Rossi’s goalbound header from a Pirlo corner. The Estonia goalkeeper saved again from the Villarreal striker after Rossi had raced on to Montolivo’s threaded pass but he was beaten by the same player on 21 minutes, Rossi controlling Cassano’s ball, advancing into the area and finishing adroitly. Estonia, swamped by the tide of blue shirts, threatened rarely, an ambitious Tarmo Kink shot leaving Gianluigi Buffon untroubled. Pereiko, while relieved to see a Rossi thunderbolt come back off the post, was then powerless to prevent Cassano’s shot on the turn going in off the same upright to double Italy’s lead. The second half continued in the same vein with Cesare Prandelli’s side painting pretty passing patterns around a tiring Estonian side. Pirlo struck the foot of the post with a free-kick on 66 minutes, but it was Pazzini who extended the Azzurri lead three minutes after replacing Cassano. The Inter Milan striker running on to Montolivo’s long ball before rifling his second international goal past Pereiko. Buffon with rarely troubled in the Italian goal and his clean sheet was Italy’s fifth in six qualifying matches.